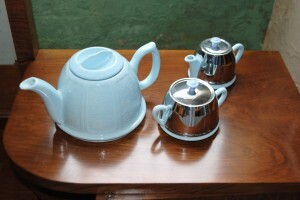 A lovely English blue and chrome original art deco tea set comprising of a teapot, sugar bowl and milk jug. For more details please call 01257 473688. 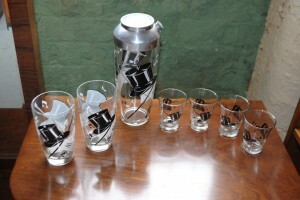 An original art deco glass cocktail set with 6 glasses and shaker. For more details please call 01257 473688. 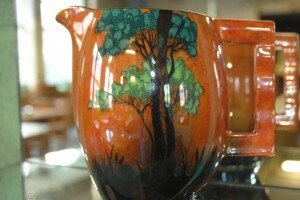 A very attractive and colourful Carlton Ware Jug with print mark A4 1966/1967 4247 on the bottom. For more details please call 01257 473688. 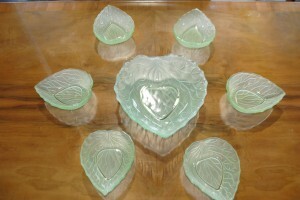 A set of 7 art deco frosted green glass bowls made by Bagley glass. Lovely shape and the pattern is called Cocktail Time. One large and 6 smaller dishes. 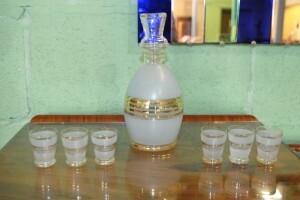 This original handmade glass art deco decanter with 6 shot glasses is fantastic. It is acid etched with gold banding and looks lovely. For more details please call 01257 473688.